Yesterday was our ‘welcome back storm’ in exactly the same spot as our ‘welcome storm’ a month ago. It was far less severe yesterday, but it was total whiteout with visibility less than 5m. There was no way to travel by kite in that, so we were tent bound. It was surprisingly cold in the tent due to the lack of sun. That also made our route choice easy. We are sticking with original plan and shall not be flying by the South Pole. Today, as per the forecast, the sun is back and the wind has dropped. The wind is due to change, to the SSE 6-10 knot that we so desperately need, tomorrow. We could do with a minimum of 10 knots to send us on our way across 350km of terrain that has hardly ever been travelled and never traversed by kite to reach the Theil Mountains. 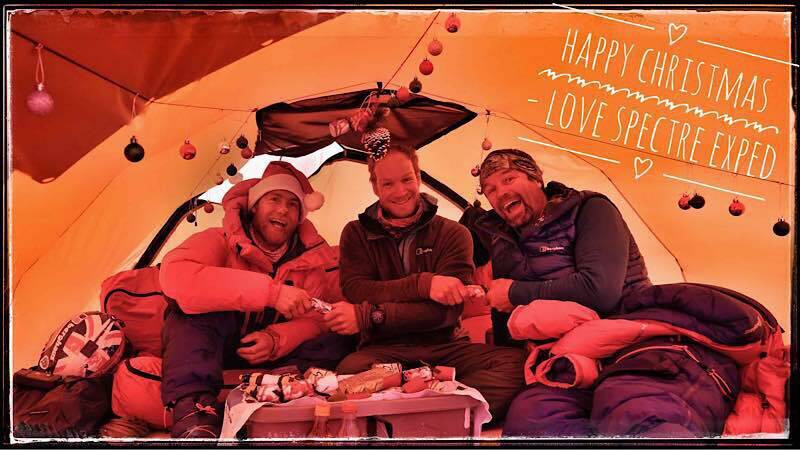 We then join the classic South Pole – Hercules Inlet kite route for 450km to the 3 sail peaks before venturing through the Sentinel Mountains back to Union Glacier. The first 350km leg to Theil Mountains is the one we are most concerned about. We need SE to S winds or we are scuppered. Our entire expedition strategy was built on the foundation of this trade wind pattern, but it is not what we have been experiencing. We have been hearing that this has been an exceptional weather year. Union glacier has experienced unusually high temperatures and Ben Saunders bensaunders.com, currently solo, unsupported crossing the continent commented on his blog, that in 17 years of Antarctic travel this was the poorest weather season he had experienced. So we must just hang in there with our strategy based on what we felt would be the most likely wind patterns. The good news is that with every km we travel on this route, we are closer to more favourable wind flows as we near Union Glacier. That means, hopefully the going should get easier. We celebrated Christmas in style today. The sun once again warming the tent – life inside is comfortable. We enjoyed smoked salmon and egg brunch with ‘Antarctic breeze’ cocktails (vodka / electrolyte mix) and rum-hot chocolate. With a few select adornments we decorated the tent and a built a Christmas sastrugi. We exchanged small gifts (the best being set of zebra boxers from Jean to Mark!?) pulled crackers and listened to some cheesy Christmas classics. We are currently pigging out on chocolate and the Queens own Fudge from Penrith toffee shop! 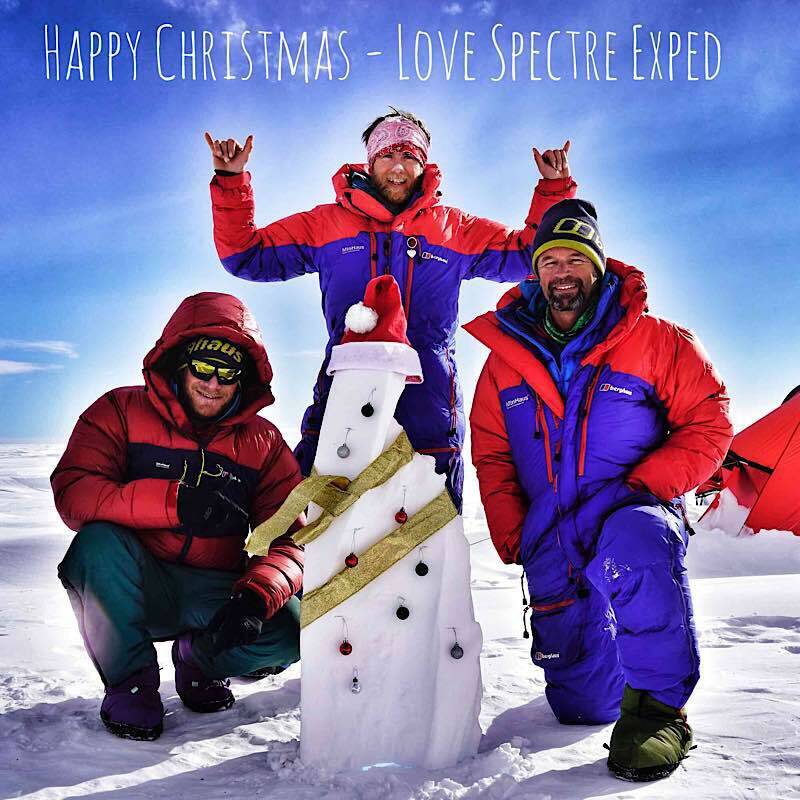 Happy Christmas everybody and to anybody reading thanks for joining us for this most extraordinary Antarctic Ride! Merry Christmas! Good to hear you celebrated in Antarctic style. Hope the winds come along you guys need to get home easily. It’s great following how you’re getting on. Thanks for all the updates. hello ! votre joie fait plaisir à voir ! c’est incroyable que vous ayez pensé à tout et déplacé la déco en pulka jusque là ! pas eu besoin de faire les courses, une bonne leçon pour nous. pour que la fête continue il ne manque plus que le bon vent pour reprendre la route et pas trop froid surtout . We wish you all the best and good (not too strong winds) for the next part of your trip. May the winds be with you! Merry Christmas lads! Enjoy your epic once in a lifetime adventure. Merry Christmas guys and here’s to a fantastic 2018 for you and yours!! Bit late, but, hu ho ho! Well Done Lads ! You have earned it tenfold !